As someone who has only just started really enjoying baths in the last year or so, it's fair to say that I'm constantly wanting to try new products that are on the market. After spotting Treacle Moon is my local Tesco, I was definitely intrigued. 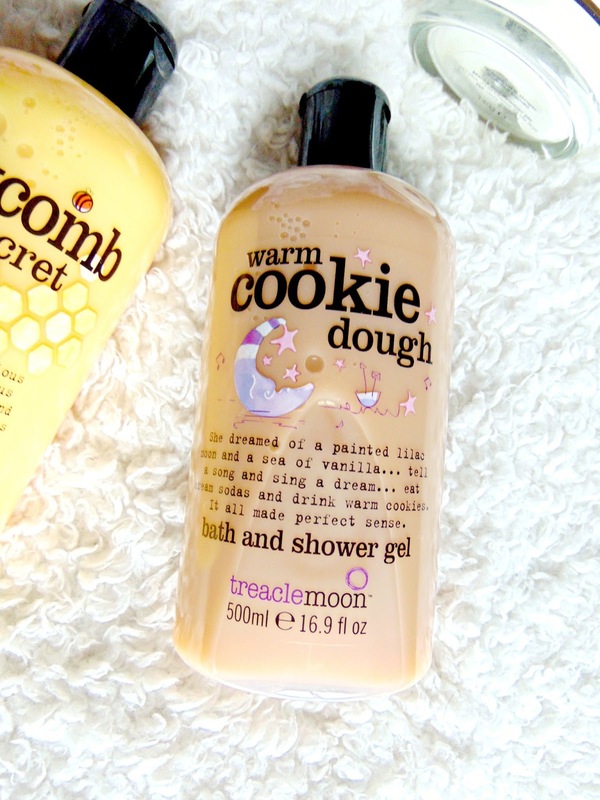 I ended up picking up a few products for myself, Warm Cookie Dough and the Honeycomb Secret. Okay, so maybe I don't know a lot about Treacle Moon products. I haven't read lots of reviews or heard loads about their products before, but after looking in Tesco for some more bubble bath, I was completely and utterly drawn to them on the shelf. The packaging for starters is very adorable. If there's one thing that completely draws me into a new product it's cute packaging. The packaging of all the products have a sweet message on, that coincides with the theme and the scent of the product and I think it's a really, lovely touch. There were so many scents on the shelf that it was honestly a struggle to pick two out of them all. My boyfriend just hovered behind, aimlessly scrolling through his phone for about 10 minutes before he started sniffing all the products himself to try and help me hurry up my decision. Finally, in the end, I choose the Honeycomb Secret and Warm Cookie Dough. In all honestly, Warm Cookie Dough was a complete no-brainer to pick up. It smells exactly like its name, sweet and delicious. It's honestly the best smelling bath product/shower gel I've ever purchased, I'm simply obsessed with it. The Honeycomb Secret smells exactly how you would imagine it to smell, a sweet honeycomb scent, which is just as delicious. There is a range of scents available from sweet to fruity in the Treacle Moon range, so there's really something that would suit everyone. Anyway, enough about the scent. I use this product both as a shower gel and as a bubble bath. It works great for both. The creamy product creates lots of lovely scented bubbles and gently moisturisers my skin. I do prefer to use the products as a shower gel, this is simply because the scent really lingers on the skin and I can still smell the sweet scents throughout the day. I also find that a little goes a long way. The tubs of 500ml are £3 each, however, they seem to last forever as you hardly need anything to ensure you have a sweet bubbly bath. All the Treacle Moon products are vegetarian-friendly, many of them including the Warm Cookie Dough are also vegan. Have you tried any of the Treacle Moon products before?